That time of the year has arrived when the sound of dhols and the dandiya sticks gets you all grooving to the ever-so sizzling Bollywood numbers. Yes, Navratri is just around the corner. We can already sense the enthusiasm women are having while shopping. The razzle-dazzle not only comes from the garba dance but also from the women who turn up in hordes, after spending hours dressing up in bright colored ghagras, chaniya cholis or bandhani/bandheji sarees. During Navratri, we follow a color code for all 9 days: 1st day: Yellow 2nd day: Green 3rd day: Black.Grey 4th day: Orange 5th day: White 6th day: Red 7th day: Royal Blue 8th day: Pink 9th day: Purple Once the outfit has been selected, the next step is choosing the perfect accessories for your attire. Fret not! Breathe a sigh of relief, as we provide you with the fashion accessories you will love to match with your cholis. Don a colorful scarf. Complete your traditional look with these vibrant and colorful stoles that are embellished with sequins, beadwork and mirror work. Select a contrast colored stole for your choli. Ethnic cluches/potlis: Complement your outfit with ethnic clutches and potlis. Tarusa World offers a wide range of aesthetically handcrafted products by the artisans. The hues and the riot of colors used will drive you to the land full of colors! Check out our exciting products: Tarusa Crome Yellow potli with all zari buttis and zari border detailing Tarusa Purple all over zardozi embroidered clutch Tarusa Sea Green silk potli with multicoloured beads with sequins and metal thread detailing Revamp your Home décor: Give your home a makeover before this festive season. We present you with our hand-embroidered cushions, table mats, tea cozies, table runners, tissue bags and wine bags. You know what’s the best thing? You can buy all of them online. Log on to our website www.tarusaworld.com and check out our ethnic collection that will captivate you with its vibrant mesh of colors. 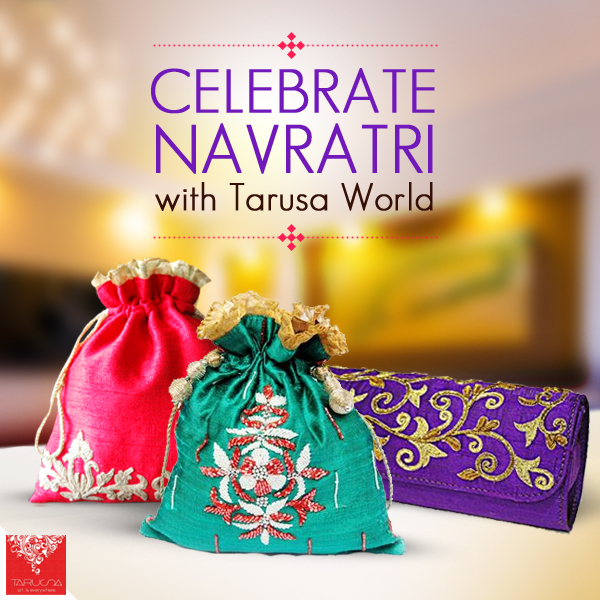 Celebrate Navratri with Tarusa World.